Once upon a time in a far away frozen land there lived a girl named Emmaline. Now Emmaline (or Emma for short) was no ordinary girl. Unlike most of her friends who constantly complained about the cold frozen landscape of Minnesota, Emma filled her head with magical dreams of frozen treats. Each time she dreamed, her heart warmed and she laughed at the thought of surrounding herself with mountains of mint chocolate chip ice cream, giant sprinkles and sugary flowers. Now Emma was lucky because she had a fairy mother who loved her very much and agreed to dedicate 7 long weeks to making her dream come alive. Even though the fairy mother knew it would be lots of time and work she decided to create a wonderland of sweets and treats to bring even more joy and laughter to Emmaline. 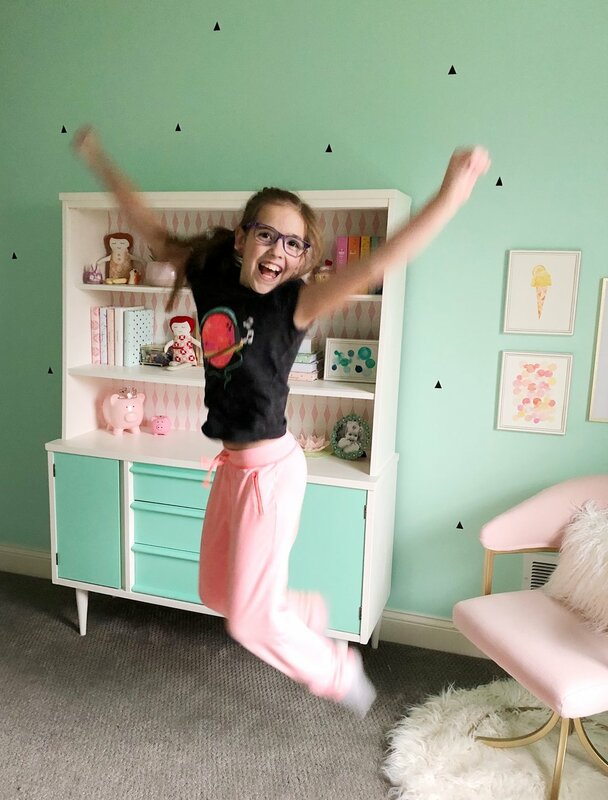 Introducing Emma's Ice Cream Social Bedroom! Come have a seat and enjoy the fantasy land of frozen treats. 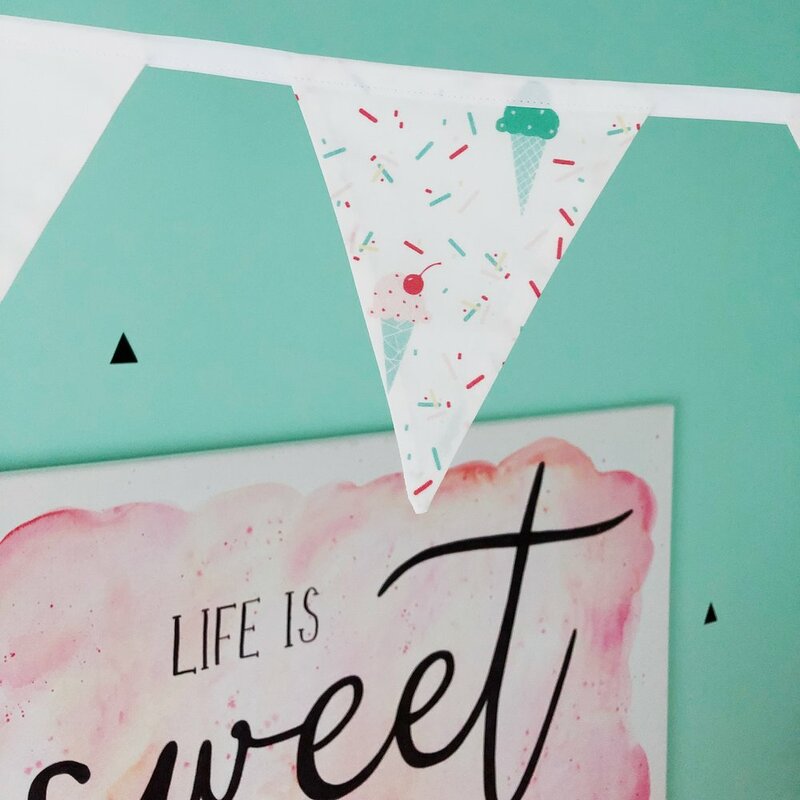 Mint chocolate chip walls, giant sprinkles and candy striped curtains remind us that we don't need to dread the cold but frozen times can be beautiful and sweet. And little reminders to always keep dreaming and not to grow up too quickly. And a place for every friend to rest at night. The fairy mother made sure to put a chair amongst the mint chocolate chip walls so that stories could easily be shared each night. She also filled the walls with handmade art to remind little Emmaline that her imagination can always take her far. So after 7 long weeks of bringing magic to life the fairy mother decided to take a long winter's nap and Emmaline forever jumped for joy and kept warm with thoughts of magical treats and visions of what her mind might think up next. Mid Century Hutch- Vintage. Read more about the hutch makeover here and here. Ice Cream Paintings- by Tessie Fay. Check the shop for art prints coming soon! Fabric Dolls- Made by Tessie. Find the pattern here. If you liked this post I would love for you to share it or pin it! I would also love to hang out with you on Instagram! You can find me here. Also, don't forget to go and check out all the other fabulous guest participants in the One Room Challenge by clicking the image below!